Winning is second nature to WHAT'S NEW. 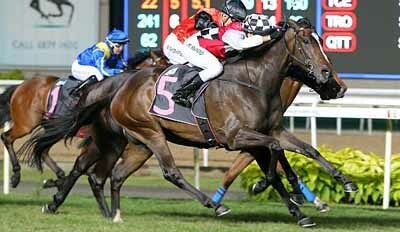 Although hard pressed again as in her previous wins, the Casino Prince mare made it four wins in 11 starts when he triumphed in the Class 3 - 1400m handicap at Kranji here tonight. Michael Rodd, who scored on her previously, rode a patient race, bringing the four-year-old from well off the pace early to win by a neck. "What’s New is such a genuine mare. She’s such a beauty and a pleasure to train," said trainer Cliff Brown. "She has a nice turn of foot and the way the track is playing tonight suited her." The Brown-Rodd combination had earlier had tasted success with another mare earlier, ARARAT LADY, who cost just NZ$3,000 as a yearling but has now won two of her three starts after finishing second in her debut.